Rugby is considered a fast sport with high levels of intensity. The sport is becoming popular in females even though it’s historically played by males. Several risk factors for rugby injuries have been identified in several studies. The incidence of rugby injury is reported to be more frequent than soccer injuries. Rugby injuries can be acute or chronic. An acute traumatic injury to a rugby player is often the result of an unexpected collision. This type of injury includes fractures, dislocations, deep cuts and bruises, and sprains and strains of ligaments and muscles. Overuse and chronic injury are a result of continuous high performance and repetitive trauma. Tendonitis of the elbow and wrist are examples of overuse injury. As a result of the repetitive actions in rugby, a player is more prone to aggravating their injury. Most rugby injuries happen during tackles, and they are much more common during matches than during training. Bruising and strains. Bruising and muscle strains are very common due to the direct and forceful contact among the players and falls. Sprains. Sprains are one of the most common causes of players seeking medical attention. It is characterized by a painful and swollen joint, as well as stiffness and weakness. Cuts. This injury is common in rugby players and they can have deep cuts in cases where there was an absence of protective pads, which is why it is important to wear the right protective gear during practice and games. Fractures. This injury particularly is common in specific areas, such as the hand and arm, due to the rough nature of this sport. Protective gear and training may make it less likely for these injuries to occur. The management of the acute lesions of rugby includes non-surgical and surgical management. Usually, rugby injuries are treated with non-surgical management but the final decision is affected by the severity of the injury. The R.I.C.E method is typically used to treat traumatic injuries. Sometimes this type of injury management can be used in cases with an overuse injury. This method is based on these four principles: rest, ice, compression and elevation. Rest is the first step in recovery. The injury may become worse if the person continues using the affected part of the body, reducing or prolonging the possibility of a complete recovery. The reduction in the level of effort of the injured body part has a positive impact on healing. Ice: Icing an injury refers to applying cold to the limb or part of the body affected by an injury. The aim of applying ice is to reduce the inflammatory process and the pain. The affected area should be ‘iced’ at proper intervals, but not for long periods of time. A recommended period of icing is about 15 minutes, avoiding direct ice contact with the skin. Compression: After an injury, swelling is common. This normal response may restrict the blood flow to the injured area and this prolongs the recovery time and pain. The injured area may benefit by being kept wrapped. It is very important to consider that the wrapping should be done with the proper technique. Elevation: Elevation of an injured area will help to diminish the swelling and inflammatory process. The elevation is most helpful when the injured area is above the heart. Sometimes, it is necessary to apply a combination of hot and cold compresses. Ice is used at the beginning of the injury, while heat can be used later to help with stiffness encountered in the healing process. Surgical treatment may be considered in cases of fractures or torn tendons or ligaments. In severe injuries, your specialized orthopedic hand surgeon may recommend a surgical procedure to repair the structures that have been damaged. The prevention of rugby injuries is a very important step in the training of the players. It has been demonstrated that conditioning can help reduce injuries. Injury prevention strategies should be developed with the aim to decrease the incidence and severity of rugby injuries. It is very important as part of the prevention that player is properly coached on defensive skills, accurate tackling techniques, accurate falling techniques, and methods to reduce forces in tackles and blocks. It is very important to consider the practice of a well balanced and structured training plan. This strategy should include important elements such as strength, flexibility, endurance, and rest. 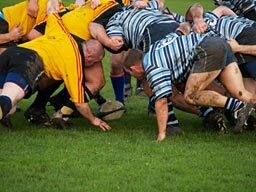 The player should always use best technique when scrumming, mauling, throwing, and rucking. Please contact us as soon as possible to schedule an appointment with our talented team. People who have been hurt while playing rugby should be evaluated to get them back in their game as efficiently as possible and reduce the possibility of extending their injury, which have lasting effects on comfort and movement.